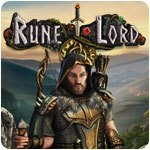 Rune Lord - Download and Play Free Version! A portal has opened and dark magic is pouring through! Only you can close the gateway and defeat the evil Ice Golem! 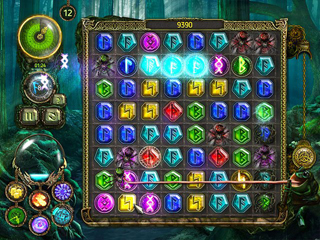 By creating matches of three or more runes, you'll collect the magic that will allow you to cast spells and complete tasks. But you'll need to hurry: time is short! As you remove obstacles from the game board and complete the fast-moving levels, you'll earn coins that allow you to purchase and then upgrade boosters and spells. 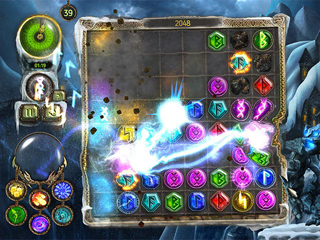 A booster might give you more time to complete a level or grant you special abilities; a spell might collect a fistful of runes or unleash a destructive wave across the game board, saving you precious seconds. With each bump in power, the spells become more and more dazzling until the screen explodes in a stunning display of animated effects. Do well and you will not only cleanse your land of the wicked scourge but you'll also earn achievements that will be the envy of your friends. Tackle the challenge of the ages and become the Rune Lord!